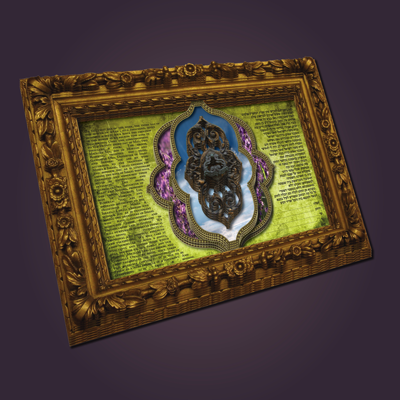 View all of the ketubah designs and select the one that speaks to your heart. 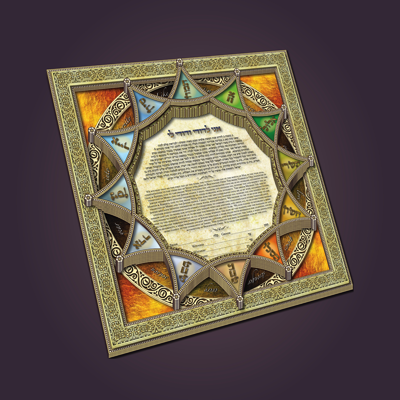 Click on "Choose My Ketubah", or on the Vertical Designs, Square Designs, Horizontal Designs, or Diamond Designs links in the navigation menu. When you find the design of your choice, click on the image or name of the ketubah to go to the details page. There you can choose the format and size that meets your needs. Click on the "Add to Cart" button to make your selection. Click on the "Next Step :: Text Options" button on the bottom of each ketubah details page, or on the navigation bar link. 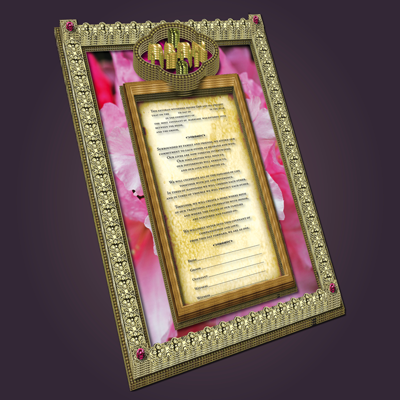 Click on the name of each ketubah text option to view it. 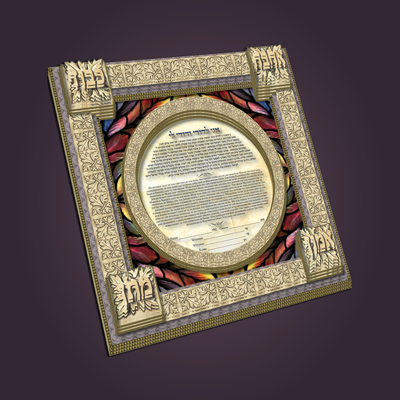 In addition to the variety of ketubah text options available on this website, you have the option to provide your own. There is no fee for English, however there is a $25 fee for translation to Hebrew. 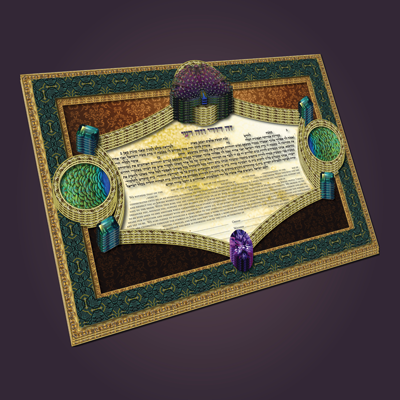 Note: Hebrew translation service may add an additional week to the ketubah production process. Please allow for that time when considering your deadline to receive your ketubah. 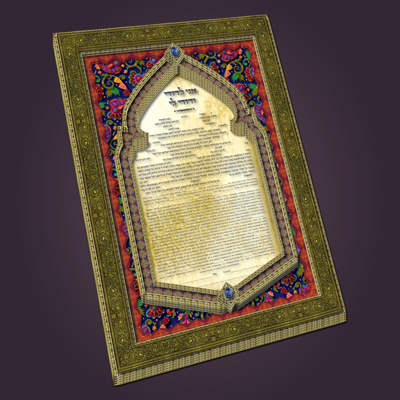 When you settle upon the ketubah text of your choice, click on the "Add to Cart" button. This will not add any additional fees to your purchase. It will only record your text selection. The exception is Hebrew translation. Click on the "Next Step :: Font Options" button on the bottom of the Text Options page, or on the navigation bar link. Click on the name of each font option to view it. When you settle upon the Hebrew and English font options of your choice, click on the "Add to Cart" button. This will not add any additional fees to your purchase. It will only record your font selections. If you are unsure which fonts to choose, contact me and I will work with you to choose the best fonts suited to your taste and ketubah design. After you select the fonts for your text, click on the "Personalize My Ketubah" link on the navigation bar or the "Next Steps :: Personalize My Ketubah" button on the bottom of the "Font Options" page. Fill out the webform completely before clicking the "Submit" button. Once I receive your paid order and personal information, I will contact you and we will start the process of creating your perfect ketubah! Click on the "View Cart" button, located at the bottom of each page to review your selections. You can also go to the "Complete My Purchase" page" and click on the "View Cart" button there. Your ketubah design, text and font choices should all be shown in your shopping cart. Click on the "Checkout with Paypal" button to complete your purchase. What does the word "ketubah" mean? The literal translation of the Hebrew word "ketubah" is "it is written".